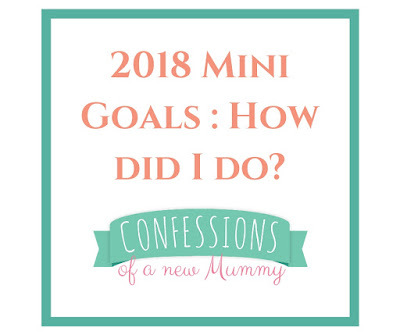 2018 Mini Goals : How did I do? We're almost half way through January. Or we were, when I first wrote this post. Its now February (already!) and I thought now would be a great time to share how I did with the Mini Goals I set myself last year. Better late than never, eh? Done! I shared last month how well I did with my goal, which you can read here. Over the year I walked 3,927,935 steps or 1,694 miles. A BBC article I've read, states that the UK National Obesity Forum consider a person walking between 7,000 and 10,000 steps a day qualify as being "moderately active". I think that's me. I'm not normally nerdy with tracking figures or information but for some reason, I do like to keep an eye on my steps and distance. Maybe its just because I like to see what I do with my time, I'm not entirely sure. A big fail with the tape measure this year. According to the scales though, I've lost a stone which I'm obviously pleased with. I didn't get to do quite as much of this as I would have liked for several reasons, the main one being that my painting space is in the corner of our conservatory and we had to use the space as a storage area for a number of months. I only managed to clear out 2 but that's better than none. I cleared out 4 pairs. Again, better than none! This one's ongoing. We've cleared out the garage that we are converting into our new kitchen and managed to clear out a number of bags of 'stuff'. I've cleared out quite a large amount of the girls toys and have even managed to sell a pushchair. I still have lots to clear though and will be continuing to work on it in 2019. The day before New Year's eve, D and I managed to sort out six full black bags of clothes and shoes for the clothes bank. That's brilliant in terms of clearing things out but the prospect of just how many 'things' we own is madness. This is a half and half. I've been doing reasonably well with the meal planning but not so well with trying new recipes. I've been writing more, just not on the blog. I've been doing some journalling at home, writing about a number of deeply personal things which I'm not comfortable sharing quite yet. Again, it is definitely something I want to continue working on. I've also been writing more at work, which is a completely different style and subject matter. Our marketing manager has been very complimentary about my writing, which has been a huge boost to my confidence. I'm hoping, time dependent as there's only so much I do, that I can continue to build on this. We're involved in the process of setting up a new publication and there's talk of my writing a regular column or page in it. The thought terrifies me and excites me in equal measures, as a teenager I wanted to be a journalist. I'm not sure how much progress I've made on this one, its a hard one to measure. I certainly don't feel as though I'm any more patient. Buying Buddy put a big spanner in the works, making a huge dent in my savings but I'm proud that I still managed to save. A few months in to 2018 I started to collect the Tesco savings stamps, just grabbing a couple here and there and by the time we reached December I had £100. It made a huge difference to our Christmas food shop and it was really nice not having to worry too much about what I was buying. In terms of actual savings, I managed to save £150 into the dog fund, which is to cover vet fees etc, and a further £914.41 went into my ISA. Several hundred pounds of this was made up of unused holiday money but in total I saved a total of £1,164. I'm really pleased with that considering I work part time and I've always been crap at saving money. I'm aiming for £800 in my savings account over the next year as I don't know what will happen with holiday over the coming year and anything else will be a bonus. What can I say? I'm trying! I missed a school parents in the class room event (luckily the kids understood!) and I missed one birthday party this year which I was annoyed with for letting the Mum and child down. I've mislaid paperwork but overall, I don't think I've been quite as bad as I usually am. I have a large family planner on the wall which I've sat down and filled in with birthdays, school dates etc and as soon as I see a school newsletter, I'm putting it next to it and adding the dates. I genuinely think it will be a constant battle! A big fat fail because the weather was just too hot for me to get out and work on it. The plan for 2019 is to get it looking just as nice but making it as easy as possible for me to maintain. I still hate doing the windows and playroom but I've been quite good at keeping on top of the jobs, trying to do odd little jobs through out the day, from wiping down the doors to cleaning the floors. I've started to keep a reusable bottle on the side in the kitchen so that I can keep sipping from it which I think has helped with me to drink more water. That said, I do still drink quite a lot of coffee and diet coke, which I'd really like to reduce, particularly the diet coke. My skin has improved no end and I've had much less in the way of spotty outbreaks this year. One thing I've been making sure to do, is not to use the same products every day and alternating the products I use otherwise I notice my skin starts to feel greasy. I've also started to try and have make up free days at the weekend. I know that might not be a big thing to many people but as someone who has always worn make up every single day regardless of whether they're going out, I'm really pleased with that. Another big fat fail because I didn't manage any of it! Did you set yourself any goals for 2018? How did you do? Congratulations on recognizing progress wherever it happens! Good for you on the weight loss! And I'm amazed on the 12 books! Well done!